An abandoned coffee plantation in Cewe, north of Burundi. The World Bank-led privatization of the coffee industry in Burundi that began in 2008 is having a negative impact on farmers, two United Nations independent experts warned today, calling for the suspension of the policy pending an assessment based on human rights. “There are worrying signs that the interests of coffee growers have been shut out of the reform process, despite coffee producer organizations showing themselves open to reform of the sector in a way that allows them to climb up the value chain,” said the Special Rapporteur on the right to food, Olivier De Schutter, and the Independent Expert on foreign debt and human rights, Cephas Lumina. Coffee accounts for 80 per cent of the country’s export earnings and provides the livelihood of 55 per cent of the population – representing some 750,000 families – many of whom are small-scale farmers. Mr. De Schutter and Mr. Lumina called on the World Bank to consider the human rights implications of privatization, adding that it must not repeat errors made in the 80s and 90s, when developing countries were encouraged to sell off State assets without taking into account the social consequences on the population. In 2007, the Burundian President declared that coffee was owned by the growers until it was exported, an arrangement that allowed them to manage the supply chain and entitled them to 72 per cent of revenues from coffee sales on international markets. However, in 2008-2009 the Burundian Government moved towards full privatization of the industry under alleged pressure from the World Bank, whose support for public health programmes was reportedly tied to coffee sector reforms. Since then, less than 5 per cent of Burundian coffee was processed in the country, with the higher value-added operations taking place abroad. The experts also expressed concern that, after six months of exchanges with the World Bank, the information provided to them falls short in scope and transparency, and fails to acknowledge disagreements between the Bank and the Burundian Government. 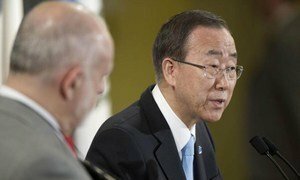 Secretary-General Ban Ki-moon today commended Burundian political actors’ commitment to dialogue as all political parties met in the country’s capital, Bujumbura, for the first time since 2010 to discuss issues related to the electoral process.